Emergency preparedness is critical for community sustainability and resilience. Emergency managers and planners should take a whole community approach to preparing for and responding to disasters. In order to prepare the community at large, individual citizens must be engaged in emergency preparedness efforts. An individual taking personal responsibility for themselves and their family is the first step to community preparedness. Depending on the size and scope of the disaster, it may take some time for the local, state and federal government to respond. Citizens that can handle basic response efforts will decrease the risk to life and property. Emergency managers should facilitate preparedness activities in their community. Volunteers in Police Service (VIPS). More information regarding these programs can be found here. According to the Federal Emergency Management Agency’s (FEMA) Ready.gov website, “the mission of Citizen Corps is to harness the power of every individual through education, training and volunteer service to make communities safer, stronger and better prepared to respond to the threats of terrorism, crime, public health issues and disasters of all kinds.” Emergency managers should contact their state Citizen Corps representative for information about starting, managing, funding and sustaining a Citizen Corps program in their community. Community Emergency Response Team (CERT), one of the Citizen Corps programs, is a basic 20-hour instructional program that covers subjects such as emergency preparedness, fire suppression, search and rescue, incident command and terrorism. The course offers citizens the training needed to take care of themselves and their family as well as mitigation techniques and disaster problem-solving. The Emergency Management Institute (EMI) in Emmitsburg, Maryland, offers a CERT Instructor and program manager course to help begin and sustain programs throughout the country. The training at EMI is also federally funded and provides a good starting point for communities that are interested in developing a Community Emergency Response Team. Another way to build a volunteer base is to work with the local health department/district to develop a Medical Reserve Corps (MRC) program. Medical Reserve Corps is also under the umbrella of Citizen Corps at the state and national levels. 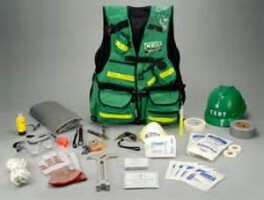 The program is designed specifically to assist in the health care aspect of disasters. MRC membership consists of medical professionals such as physicians, nurses, and dentists as well as clergy, secretaries and other general volunteers. All disasters can affect the health of the public and MRC volunteers can play a crucial role in providing emergency services or fill in a gap to provide services that are disrupted because of a disaster. Faith-based organizations are a good resource for emergency managers. Their mission of helping and ministering to people translates well into disaster relief. Many faith-based organizations have disaster response functions already established at the state or national level. For example, the Southern Baptist Convention Disaster Relief organization has approximately 80,000 volunteers that are trained to respond to disasters all over the United States to assist with cleaning up and rebuilding after disaster. Faith-based organizations can be utilized during disasters to perform other tasks such as baby-sitting services, animal assistance, counseling services, volunteer reception center coordination, damage assessments and debris removal. Emergency managers should connect with representatives from their faith-based community and engage them in preparedness and response activities. Another avenue for emergency managers to engage the community is to host or attend community meetings or functions. Many communities have local fairs that offer a great opportunity to connect with the community and offer preparedness materials. Speaking at civic club meetings, such as Rotary or Kiwanis, is another avenue to reach the citizens. Emergency managers can offer many short training programs such as amateur radio and storm spotter courses. These courses engage the citizens without a lot of time commitment from the emergency manager and can be completed with little or no financial resources. Emergency managers can also host community preparedness gatherings and provide information about training opportunities, go kits, emergency supply kits, emergency response efforts, local hazards and emergency management functions. There are several benefits to creating programs that engage citizens. First, as people take personal responsibility they depend less on governmental support. Teaching citizens to take care of themselves and their families can reduce 9-1-1 calls. Trained citizens can mitigate hazards as well as assist professional first responders. Lastly, promoting community programs can bridge the gap between first responders, emergency management and citizens. This can increase local governmental support of emergency management initiatives. Recovery efforts are increasingly becoming the responsibility of individuals with the help of the state and local governments. The days of relying on the federal government are in the past. As such, creating programs that citizens can productively contribute to disaster relief in their communities is important to preparedness and recovery efforts. Having local volunteers assist in disaster response efforts can make a difference in the speed of recovery as well as have a tremendous financial impact. Coordinated volunteers that work within the community to assist with recovery efforts can diminish the local financial contribution to disaster recovery. According to the article, “Independent Sector’s Value of Volunteer Time,” the national estimated value for a volunteer is $22.55 per hour. It is clear the financial impact that volunteers can have on a community during recovery. Emergency managers need to engage the whole community in emergency preparedness to ensure sustainability and resilience. In FEMA’s guide, “A Whole Community Approach to Emergency Management: Principles, Themes and Pathways for Action,” connecting the private sector, nonprofit organizations and the citizens is the key to effective emergency management for the whole community. “The challenge for those engaged in emergency management is to understand how to work with the diversity of groups and organizations and the policies and practices that emerge from them in an effort to improve the ability of local residents to prevent, protect against, mitigate, respond to, and recover from any type of threat or hazard effectively.” To engage the whole community, emergency managers must first be engaged in the community. The effort is great on the front end, but the rewards will be multiplied for years to come. Author: Jenny Raspberry is a master’s student in the Department of Emergency Management at Jacksonville State University. She is also the emergency preparedness specialist for District 4 Public Health in LaGrange, Georgia. Her email is: [email protected].